Isabelle (10) and I, (10+) headed down to the Coromandel to cycle another section of the Hauraki Rail Trail. We had previously ridden between the Karangahake Gorge and Waikino and this time we decided we would cycle between Waikino and Waihi. We spent the night tucked up in our little cottage investigating the logistics of the next day’s ride. Not only did we want to cycle we also wanted to ride the Goldfields Train and although the weather had been shite, there was supposed to be a break in the weather the next morning with the rain returning later on that afternoon, this meant we wanted to be on the cycle trail reasonably early. The original plan was to drive to Waikino (as it was the closest point to our lodgings), cycle to Waihi and then catch the train back, however I didn’t want to have to push Isabelle to go at a pace she was uncomfortable with to be able to catch a train, this was after all “a holiday” so in the end I decided to drive to the furthest point of the trail (Waihi) and booked 2 tickets on the first train of the day to Waikino which meant that Isabelle and I could cycle back to the car at our own pace. The Goldfields Train is a lovely step back in time and I’ll write a longer blog post about it at a later date but for now I would like to mention that if the weather permits I highly recommend sitting in the open air carriage, it’s pretty special! When you arrive at the Waikino Railway Station unless you have visited the area before it’s not immediately obvious where the cycle trail starts so for the record, from the station, you’ll need to cycle through the car park and across the road. Head towards the low brick wall and cycle through the gap. Travel down what looks like old remnants of the train track and go through the tunnel at the bottom of the short descent. 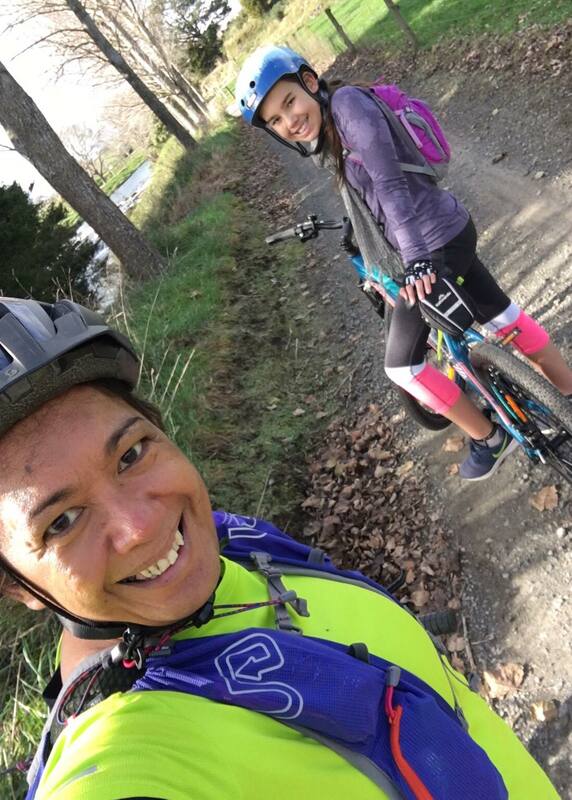 From the tunnel the trail narrows and turns sharply right and up a slight rise to a bridge that crosses over the Ohinemuri River to meet the Hauraki Rail Trail, to continue to Waihi you’ll need to turn left. Although the Karangahake to Waikino section has some big WOW moments such as the 1km long tunnel and the Victorian Battery the section between Waikino and Waihi is much nicer to ride. It winds it’s way through the countryside and is much more visually appealing over it’s entire length and it’s also not completely flat so it’s not as boring to ride either. 😉 It’s recently been upgraded and there are information boards along the way (although we did not stop to read any of them) and even though there are a couple of quite short sharp ascents, the entire length is completely ride able even for a 10 year old. My favorite part was a small section that looked like it had been carved through a stone wall, Isabelle’s favorite part was the steep hill, because she managed to get to the top without stopping and I couldn’t, although to be fair, she has more gears on her new fancy pants bike lolol. One thing is for certain, if we went back again and we had to choose riding between the Karangahake Gorge and Waikino OR Waikino and Waihi, we’d both definitely pick the latter of the two.